It is just the start of the summer season and news on water stress, municipal water supply cuts and rationing of water has already started pouring in. In November last year, Down To Earth reported how India’s cities like Mumbai, Jaipur, Lucknow, Nagpur and Chennai were facing an acute shortage of water and many had started water rationing. The elections to the Lower House of India’s Parliament, the Lok Sabha, start this month and many areas in the country have decided to exercise their voting rights only if they get water. For instance, Hyderabad’s Laxmiguda Housing Board Colony, where poor and weaker sections reside, is in the news for this. Even hill town Mussourie has planned to boycott the polls if restrictions on water supply are not lifted. In Pune, the civic authority is in conflict with the irrigation department since late 2018 for supplying more water. The irrigation department says they want water till July this year and hence has shut down pumps, including the Khadakwasla dam in Pune. Other than Pune, major dams in Maharashtra’s Marathwada region have hit rock bottom, according to news reports published last month. The Water Resources Department says water will be made available only for drinking till the next rains. In 2018, a NITI Aayog report said water levels in 54 per cent of India’s groundwater wells were declining, and 21 major cities were expected to run out of groundwater as soon as 2020, affecting almost 100 million people. 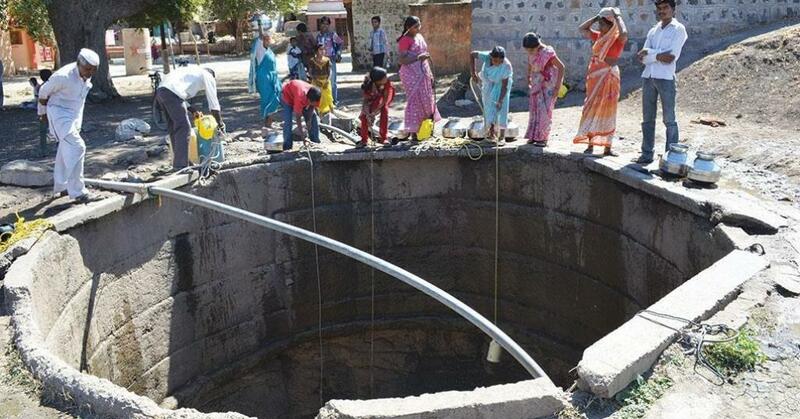 Bridging this gap by relying solely on groundwater is not a feasible solution, opine experts. A 2018 report by WaterAid adds that the demand for water will also increase with increasing urbanisation. Already, the number of people living in urban areas has increased by 1.6 times from 2001 to 2011. In mid-November 2018, the Brihanmumbai Municipal Corporation (BMC) announced a 10 per cent cut in the megacity’s water supply and cut the supply timing by 15 per cent. Mumbai's water supply comes from lakes including Modak Sagar, Tansa, Vihar and Tulsi as well as dams including Upper Vaitarna, Bhatsa and Middle Vaitarna. While Bhatsa and Upper Vaitarna are maintained by the state government, the others are maintained by the BMC. Water stocks in the seven reservoirs is 15 per cent lesser than the previous year, say media reports. Mumbai has faced water rationing previously as well. It was 20 per cent in 2015, 20 per cent in 2014, and 30 per cent in 2009. The BMC recently announced that rationing will be continued until it rains in 2019. Jaipur started water rationing even before the monsoon ended in September 2018. This was due to a decrease in the amount of water in the Bisalpur dam, which is the main source of water for Rajasthan’s capital city. The Public Health Engineering Department (PHED), responsible for water supply, has received complaints on weak monitoring and improper rationing. Due to lesser rainfall, the dam’s reserves have been affected. PHED is now supplying water for 45 to 70 minutes as opposed to the usual one and half hours. The supply to Jaipur from this dam has reduced from 44 crore litres every day to 35 crore litres per day. The PHED has planned to dig 279 new tube wells and restore 273 old tube wells according to news reports. Chennai, another port city, is also facing a water crisis. In the beginning of November 2018, media reports stated the reservoirs supplying water to Chennai had storage for only 15 days. In case, there was not enough rain (North East Monsoon) by the end of November, the city would reel under a severe water crisis. The combined storage in the city’s four reservoirs on November 3, 2018, was 1,758 million cubic feet (mcft) against 2,114 mcft recorded the same time in 2017. The city received 675 MLD (million litres a day) of which 520 MLD is for households. Generally, the supply was around 830 MLD. In 2019, 165 MLD was being pumped from the Veeranam reservoir every day, 100 MLD from the Nemmeli desalination plant and 100 MLD from the Minjur desalination plant. Officials say the city has not started rationing water but is supplying it on every alternate day. The city is looking for alternatives like quarries, pumping of agricultural wells and lake water. Restrictions have been imposed on groundwater withdrawal. In January 2019, the drinking water supply in the city came down to less than 60 litres per day per person. In March this year, a news report said an official had revealed that the water supply in Chennai’s suburbs has already been reduced to once a week and this has pushed the residents to extract more and more groundwater. The report also talks about declining groundwater levels in these areas. The city of Nagpur is also preparing itself for water cuts in the upcoming months, say news reports. This is because of the poor storage in Pench reservoir. This month, the District Water Reservation Committee reduced the water supply to the city and other towns in the district due to low water reserves in the reservoir. From November 1, 2018, the committee had made an allocation of 155 million cubic metres (mcm) water to the Nagpur Municipal Corporation as against the supply of 195 mcm. This is likely to continue for a year. Water rationing has also begun in Bathinda, Punjab. Almost 50 per cent of the water supply to the city has been cut down due to repair work being carried out on the Sirhind Canal, the only source of water. The city has no other option but to rely on contaminated groundwater. A single source of water and lack of sustainability plan have also put Lucknow under water stress. A few pockets like Gomtinagar and Indira Nagar depend on Kathauta lake, which receives water from the Sharda Canal, currently closed for maintenance. The water supply has been reduced to five hours/day from 16 hours/day. The lake had reserves only for seven days in mid-November 2018. Every year, residents face the same problem and as an alternative, they switch to groundwater and tanker supply. Alternate sustainable sources are yet to be planned for many areas in the city. So what is the reason for this crisis in cities? The Citizens’ Seventh Report on the State of India’s Environment (SOE) by Delhi-based non-profit Centre for Science and Environment says Indian cities initially relied on rivers, lakes, tanks or systems using groundwater recharge like stepwells or wells. These have now dried up, got filled or are too polluted to use. Cities should augment the local water supply, protect waterbodies and incentivise rainwater harvesting. Sewage treatment and reuse and recycling of water should be practiced as far as possible.